At Westlake Hills Dentistry we know how painful wisdom teeth can be. 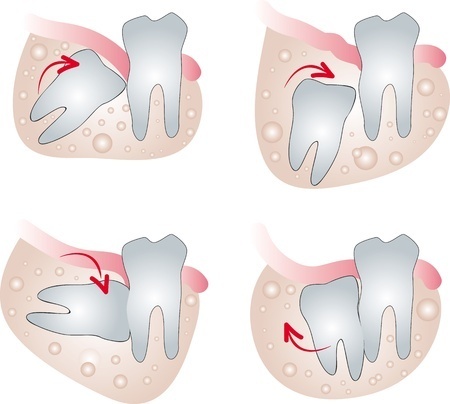 Wisdom teeth (also known as third molars) usually start to come in during the late teens and early twenties. Some people don’t experience any pain or complications when their wisdom teeth come in, but the majority of people will experience pain and may need to have their wisdom teeth extracted. This could be because the wisdom teeth don’t have enough room to come in properly or they may become impacted and cause a great deal of pain. Sometimes when the wisdom teeth start to come in they push your other teeth out of place. This can undo many dollars’ worth of orthodontic treatments you may have received as a teenager or young adult. Pericoronitis also may develop. This is an infection caused by a wisdom tooth that has not completely broken through the gum, and a flap of the gum material may partially cover the tooth. Food debris can get trapped under the gum flap and cause infection. If the wisdom teeth are unable to break through the gum they may become infected and impacted. Cysts may also develop which are very painful and need to be treated. If you are experiencing pain or your wisdom teeth are impacted Dr. Ho and/or Dr. Burden, may recommend the extraction of your wisdom teeth. This procedure may be done as a simple extraction, or you may need a surgical extraction depending on the condition and location of your wisdom teeth. Dr. Burden manages all our complicated surgical cases from extractions to IV Sedation, Dr. Burden works out of our office to take care of your surgical needs. Dr. Burden graduated from the University of Texas Health Science Center in San Antonio. He completed his under-graduate studies at Texas A&M University in 2001, where he received a B.S. in Genetics. Additionally, Dr. Burden also completed a one-year advanced education in general dentistry residency at UTHSCSA, where he received training in Intravenous Conscious Sedation, complicated oral surgery procedures, and implant dentistry procedures. The lower teeth’s relationship to the inferior alveolar nerve. This nerve gives feeling to your lower jaw, lower lip, lower teeth, and chin. Based on the x-rays and examination Dr. Ho and Dr. Burden will recommend the type of extraction they feel would be best for you. First you will be made comfortable and the doctor will answer any questions about the extraction procedure. Your wisdom teeth may be able to be extracted using only local anesthesia. If this is the case a local anesthesia will be administered and the tooth extracted. If you need a more involved procedure the doctor may recommend conscious sedation or general anesthesia. If your wisdom tooth is impacted you may need oral surgery to remove it. How your wisdom teeth are positioned and the relationship to your other teeth and sinuses will determine how extensive the extraction process will be. Under conscious sedation you will be aware of your surroundings, but very relaxed. Under general anesthesia you will be completely asleep. The doctor may have to make a small incision in your gum to remove the teeth, and you may need stitches which will dissolve in a few weeks. After surgery the doctor may ask you to bite down on a piece of gauze for about 30 to 45 minutes when you leave the office. This helps control bleeding and keeps the area clean and protected. You should rinse your mouth with a solution of warm salt water (one teaspoon of salt to a cup of warm water) to keep the area clean. This will also help prevent infection and speed healing. Over-the-counter NSAID pain relievers such as Advil or Alleve may be used to help control pain and inflammation. You can also apply ice packs to your cheeks to help reduce pain and swelling. Eat soft foods, do not drink through a straw, and do not smoke while your socket heals. If you had stitches they should dissolve on their own within a few weeks. You may brush your teeth as normal, but avoid the area of extraction. Most people heal and have no complications within a few weeks after extractions. If you experience fever, chills, trouble swallowing, numbness which lasts more than a few hours after extraction seek medical attention or return to the office. Just about everyone gets their wisdom teeth in their late teens or early twenties. But you can experience pain from wisdom teeth at any age after puberty. At Westlake Hills Dentistry we want you to have good oral health and be pain free. For more information about wisdom teeth and wisdom teeth extractions contact Westlake Hills Cosmetic Dentistry today. Our offices are equipped to provide an array of restorative procedures such as porcelain veneers, dental implants, composite bonding, and tooth-colored fillings.